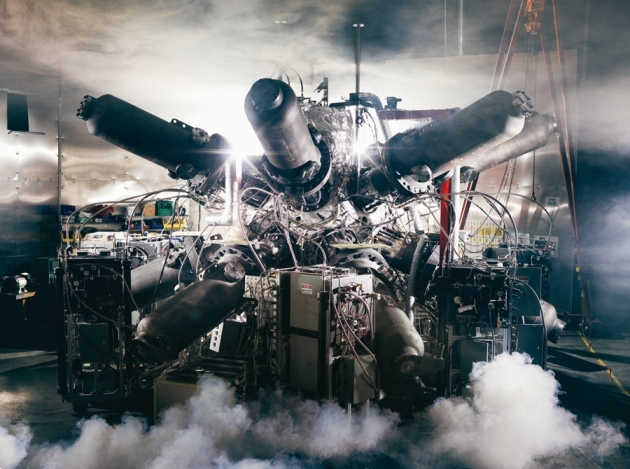 Developments is Fusion Technology | Passing Through . . . .
Fuelled by venture capital and a lot of hope, alternative fusion technologies are heating up. General Fusion’s reactor would use massive pistons to crush fuel in a spinning vortex of liquid lead. To reach one of the world’s most secretive nuclear-fusion companies, visitors must wind their way through a suburban office park at the foot of the Santa Ana Mountains, just east of Irvine, California, until they pull up outside the large but unmarked headquarters of Tri Alpha Energy. This is as close as any outsider can get without signing a non-disclosure agreement; Tri Alpha protects its trade secrets so tightly that it does not even have a website. But the fragments of information that have filtered out make it clear that the building houses one of the largest fusion experiments now operating in the United States. It is also one of the most unconventional. Instead of using the doughnut-shaped ‘tokamak’ reactor that has dominated fusion-energy research for more than 40 years, Tri Alpha is testing a linear reactor that it claims will be smaller, simpler and cheaper — and will lead to commercial fusion power in little more than a decade, far ahead of the 30 to 50 years often quoted for tokamaks. That sounds particularly appealing at a time when the world’s leading fusion project, a giant tokamak named ITER, is mired in delays and cost overruns. The facility, being built in Cadarache, France, is expected to be the first fusion reactor capable of generating an excess of energy from a sustained burn of its plasma fuel. But it looks set to cost as much as US$50 billion — about 10 times the original estimate — and will not begin its first fuelled experiments before 2027, 11 years behind schedule. With ITER consuming the lion’s share of the US fusion-energy budget, fans of alternative approaches have scant government support. But growing impatience with the tokamak technology has spurred the Tri Alpha team and many other physicists in the United States and Canada to pursue different options. Over the past decade and a half, these mavericks have launched at least half a dozen companies to pursue alternative designs for fusion reactors. Some are reporting encouraging results, not to mention attracting sizeable investments. Tri Alpha itself has raised $150 million from the likes of Microsoft co-founder Paul Allen and the Russian government’s venture-capital firm, Rusnano. But that success is bringing increased scrutiny of their bold promises. Tri Alpha “has got very tough problems to overcome as it starts scaling up to reactor size”, says Jeffrey Freidberg, a nuclear physicist at the Massachusetts Institute of Technology (MIT) in Cambridge. For example, the company must prove that it can achieve the billion-kelvin temperatures needed to burn the exotic fuel it wants to use, and must demonstrate a practical way to convert the energy output into electricity. Similar questions could be raised about any of the other upstarts, says Stephen Dean, who heads Fusion Power Associates, an advocacy group in Gaithersburg, Maryland. “I don’t think you can honestly say that any of these things are at the stage where fusion can be demonstrated quickly,” he says. Will alternative fusion companies be able to sustain their momentum and justify their founders’ optimism? Or will they fizzle like so many fusion dreams before them? In principle, building a fusion reactor is just a matter of imitating the Sun. Take the appropriate isotopes of hydrogen or other light elements, add heat to strip the electrons from the nuclei and form an ionized plasma, then compress that plasma and hold it together for a while, allowing the nuclei to fuse and convert a portion of their mass into energy. But in practice, trying to mimic a star leads to horrendous engineering problems: for example, hot plasma trapped in a magnetic field tends to twist and turn like an enraged snake struggling to escape. Fusion researchers have long favoured tokamaks as the best way to contain this plasma beast. Developed by Soviet physicists in the 1950s and announced to the West a decade later, the reactors achieved plasma densities, temperatures and confinement times much higher than any machine before them. And as physicists refined the design, they improved the way that tokamaks controlled high-energy plasma. But from the beginning, many physicists have wondered whether tokamaks could ever be scaled up to achieve commercial power output. They are dauntingly complex, for starters. The toroidal chamber has to be wound with multiple sets of electromagnetic coils to shape the magnetic field that confines the plasma. And more coils run through the doughnut hole to drive a powerful electric current through the plasma (see ‘Trapping fusion fire’). Then there is the fuel, a mixture of the hydrogen isotopes deuterium (D) and tritium (T). D–T is widely regarded as the only sane choice for a power reactor because it ignites at a lower temperature than any other combination — only about 100 million kelvin — and releases much more energy. But 80% of that energy emerges from the reaction in the form of speeding neutrons, which would wreak havoc on the walls of a power reactor, leaving them highly radioactive. To generate electricity, the neutrons’ energy would have to be used to heat water in a conventional steam turbine — a process that is only 30–40% efficient. Cost, complexity and slow progress have also dogged inertial-confinement fusion, the most prominent alternative to the tokamaks’ magnetic confinement. This approach, in which frozen fuel pellets are imploded by high-powered laser beams, has also received a lot of government funding. But despite decades of effort on inertial confinement, initiatives such as the National Ignition Facility at Lawrence Livermore National Laboratory in Livermore, California, are still struggling to deliver on their fusion-power promises (see Nature 491, 159; 2012). Such concerns have sparked some enthusiasm for the stellarator: a toroidal device that simplifies certain aspects of the tokamak but requires even more complex magnets. But most mainstream plasma physicists have simply left the practical engineering issues for later, assuming that fixes will emerge after the plasma physics has been worked out. The fusion mavericks are among the minority who argue that a more radical solution is needed: first get the engineering right, by designing a simple, cheap reactor that power companies might actually want to buy, and then try to make the plasmas behave. One of those upstarts is Norman Rostoker, a physicist at the University of California, Irvine, who co-founded Tri Alpha in 1998 at the age of 72. He and his colleagues proposed ditching D–T fuel in favour of fusing protons with boron-11, a stable isotope that comprises about 80% of natural boron. Igniting this p–11B fuel would require temperatures of about a billion kelvin, almost 100 times as hot as the core of the Sun. And the energy created in each fusion event would be only about half that released by D–T. But the reaction products would be practically free of troublesome neutrons: the fusion would generate just three energetic helium nuclei, also known as α-particles. These are charged, so they could be guided by magnetic fields into an ‘inverse cyclotron’ device that would convert their energy into an ordinary electric current with around 90% efficiency. 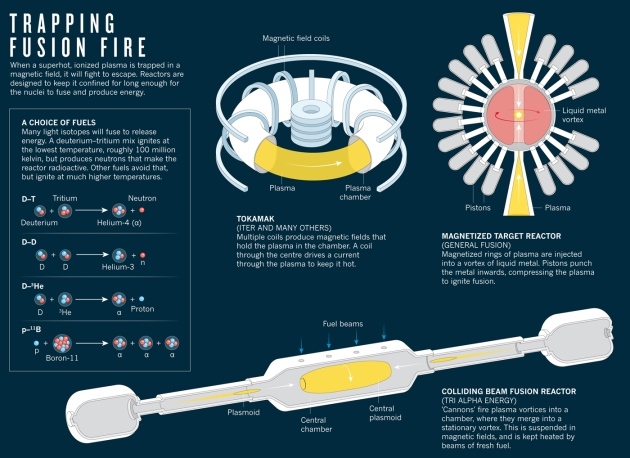 Burning a billion-kelvin p–11B plasma in a tokamak was out of the question, not least because unfeasibly large magnetic fields would be needed to confine it. So Rostoker and his colleagues designed a linear reactor that looks like two cannons pointed barrel to barrel. Each cannon would fire rings of plasma called plasmoids that are known to be remarkably stable: the flow of ions in the plasma would generate a magnetic field, which in turn would keep the plasma confined. “It’s the most ideal configuration you could imagine,” says Alan Hoffman, a plasma physicist at the University of Washington in Seattle. To start the reactor, each cannon would fire a plasmoid into a central chamber, where the two would merge into a larger, free-floating plasmoid that would survive for as long as it could be fed with additional fuel. The α-particles emerging from the reaction would be guided back through the cannons by another magnetic field, and captured in the energy converter. So Rostoker and his colleagues decided to take advantage of the United States’ robust culture of high-tech startups and venture-capital funding. They formed a company, naming it Tri Alpha after the output of the p–11B reaction, and went on to raise enough investment to employ more than 100 people. Dean suspects that the start-up mindset may explain why Tri Alpha is so secretive. “It’s part of the mystique of being a venture-capital-funded company: develop your ideas before anyone else can see them,” he says. But over the past five years or so, the company has started to let its employees publish results and present at conferences. With its current test machine, a 10-metre device called the C-2, Tri Alpha has shown that the colliding plasmoids merge as expected2, and that the fireball can sustain itself for up to 4 milliseconds — impressively long by plasma-physics standards — as long as fuel beams are being injected3. Last year, Tri Alpha researcher Houyang Guo announced at a plasma conference in Fort Worth, Texas, that the burn duration had increased to 5 milliseconds. The company is now looking for cash to build a larger machine. “As a science programme, it’s been highly successful,” says Hoffman, who reviewed the work for Allen when the billionaire was deciding whether to invest. “But it’s not p–11B.” So far, he says, Tri Alpha has run its C-2 only with deuterium, and it is a long way from achieving the extreme plasma conditions needed to burn its ultimate fuel. Helion has demonstrated the concept4 in a D–D reactor with plasmoids that fire once every three minutes, and it is now seeking $15 million in private financing over the next five years to develop a full-scale machine that could use D–T fuel to reach the break-even point, when it generates as much energy as it takes to run. The company hopes that its reactor could eventually reach the hotter conditions needed to fuse deuterium with helium-3, another combination that produces only α-particles and protons, with no neutron by-products. Other alternative concepts stick with D–T fuel, but confine it in different ways. In Burnaby, Canada, researchers at General Fusion have designed a reactor in which a plasmoid of D–T will be injected into a spinning vortex of liquid lead, which will then be crushed inwards by a forest of pistons. If this compression happens within a few microseconds, the plasma will implode to create fusion conditions5. One advantage of this design is that the liquid lead does not degrade when it gets blasted by neutrons, says Michel Laberge, who founded General Fusion in 2002. It is not clear how much of that support will come from the US energy department in the foreseeable future. The department’s fusion-energy programme has provided a modicum of cash for Helion, as well as for some small-scale academic work on alternative reactors. And its long-shot funding agency, the Advanced Research Projects Agency—Energy, has expressed interest in some of the alterative concepts, to the extent of holding a workshop on them last year. The fusion-energy advisory committee is preparing a ten-year research plan, due by the start of next year, that could conceivably lead to more backing for the upstarts. But funds are tight, and ITER continues to be a huge financial drain. For now, the big money will probably have to come from the private sector. And despite the many technical hurdles, investors seem willing to take a chance. while also saving a considerable amount on your day to day expenses, thereby increasing your profits.